About two years ago, John Corrigan decided that social enterprises and nonprofits should have access to the same level of marketing insights the big guys get. To that end, he formed Journimap, an L3C aimed at providing cloud-based tools for understanding customer experience. “We’re helping organizations that don’t have the budgets of big, for-profits,” he says. For marketing folks, understanding the customer experience is really important. Specifically, they want insights into what is known as “the customer journey”. Of course, that’s not whether shoppers endured a lot of traffic while driving to the store. It’s the beginning-to-end experience they had, a variety of encounters and interactions that happen over time, from when they first learn about a product to when they come back to buy another one or vow never to make a similar purchase again. Getting a good handle on all this isn’t an idle exercise. Companies can boost customer satisfaction by 20% and improve sales by 20%, according to McKinsey. But as you can imagine, there are many points along this journey. So it’s helpful to map the voyage, creating a visual representation of what happens. Ideally, a phalanx of researchers surveys a great many customers looking for moments of truth—positive and negative points that are essential to the customer experience. Then that information is integrated with other systems, ultimately allowing the company to make necessary changes to its processes. Here’s the problem: This approach costs a lot of money—perhaps a six to seven figure budget. Corrigan’s alternative, which is now in beta, is a cloud-based system that, while not as powerful as what large companies can use, is an affordable option for smaller outfits. What happens is, you send out a 30-question survey via email or social media. When you receive 18 completed surveys, then an algorithm kicks in, producing a narrative description/summary of findings, “empathy read-outs”—think “confused” or “informed” —and an emotion metric incorporating positive and negative responses. Then there’s a visual map charting ups and downs during five phases of activity. According to Corrigan, the insights can be surprising. He points to a health-care products company which learned that customers who dropped the service initially had a better experience at the point of purchase than those who remained. In other words, those who stayed as customers never had as great or as disappointing an experience as those who left. 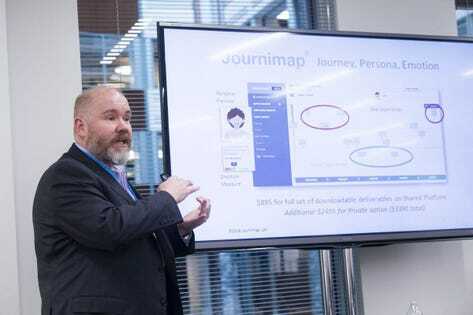 Corrigan got the idea while working for ACT, the nonprofit educational testing company, where he did working mapping the customer journey of students from under-privileged backgrounds whose families had never gone to college. “I would give talks at conferences about customer experience work and all these smaller organizations would track me down to find out how people who don’t have a multi-million dollar budget can do this,” he says. He decided there had to be a way to provide at least a scaled-down capability. With that in mind, he formed a company to do so. Because his most important mission was a social one, he decided to form an L3C. He also formed an LLC called Journiworks. That’s a content company through which he produces podcasts, gives speaking engagements and the like on related topics and is a regular for-profit.